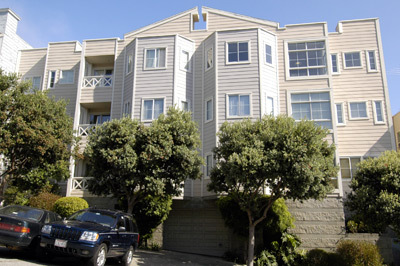 This top floor one bedroom condominium is centrally located in San Francisco’s desirable Anza Vista neighborhood. The unit is very bright. The living room is filled with windows from which there are panoramic views of the city. The property has been recently upgraded. The kitchen has cherry cabinets with granite countertops. The bathroom has slate flooring, a cherry cabinet below the sink, and a countertop made from French limestone. There are new hardwood floors in the living area. This unit is a part of a 15 unit condominium complex located on a beautiful tree lined block of Eddy Street. There is one car deeded parking in a secured garage. This home is just a short walk to the shops and restaurants of the Fillmore Shopping District and the Divisidero Corridor.